RICHMOND, Va. - Feb. 16, 2018 - PRLog -- Patrick McFadden, Founder and Marketing Consultant at Indispensable Marketing, will kickoff the Coffee Connection Series Sponsored by C&F Bank, Tuesday, February 20th at 9:00 am, 2545 Bellwood Road Richmond, VA 23237 highlighting 5 Things You Can Do Right Now to Rev Up Your 2018 Marketing. McFadden will simplify marketing strategies and give effective tips and tools for small businesses wanting to explore and grow in 2018. In this presentation you can expect no frills, McFadden will reveal 5 tactics any business can employ today to start getting more from their marketing. Each tactic includes an explanation of the precise action steps and tools needed to make it happen. "I love to talk about marketing strategy, but every now and then you've got to knuckle down and execute!" said McFadden. As a small business marketing expert who understands what small business owners need to do to improve this year, McFadden will be using his experience and knowledge to help small business owners deploy their resources strategically for their company to succeed. A non-profit small business incubator offering office and warehouse space to new businesses transitioning from a non-traditional environment. BizWorks was founded in 2001 as a project of the Jefferson Davis Association as the Jefferson Davis Enterprise Center. In 2013 Bizworks became an independent 501c3 organization under the name BizWorks Enterprise Center. BizWorks' programs and operations are supported in large part through the support of a Chesterfield County Community Block Grant and General Fund, which is funded by HUD. 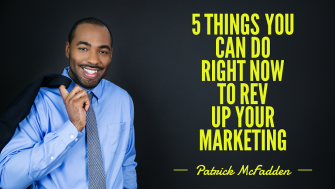 In 2012 our founder Patrick McFadden noticed the most frustrating part of marketing for any small to midsize business is that there was no logical or process way to understand marketing, implement marketing or buy marketing services from people pitching social media, SEO, content, web design, branding, etc. Often small business owners would buy from the sales rep or account manager who could best promise to grow their business.